It’s been a number of months since I’ve written anything related to atheism or Christianity, and for good reason. I’ve said my piece on the topics and I don’t feel it does much good to keep repeating myself. If everything I’ve written in the past hasn’t been convincing enough, one more post isn’t going to add to it. So, it’s with a bit of reluctance that I write this at all. I just can’t keep this in. The picture below popped up in my Facebook newsfeed, which bothered me for multiple reasons, and as I showered in the morning I couldn’t help but stew over everything that was wrong and ignorant about it. Let me start with this picture’s basic assertion. It is, essentially, just a more topical version of the old, patently false axiom, “There are no atheists in foxholes.” This isn’t just a condescending dismissal of atheism, but also of the pantywaist belief that maybe guns aren’t the solution to every problem. 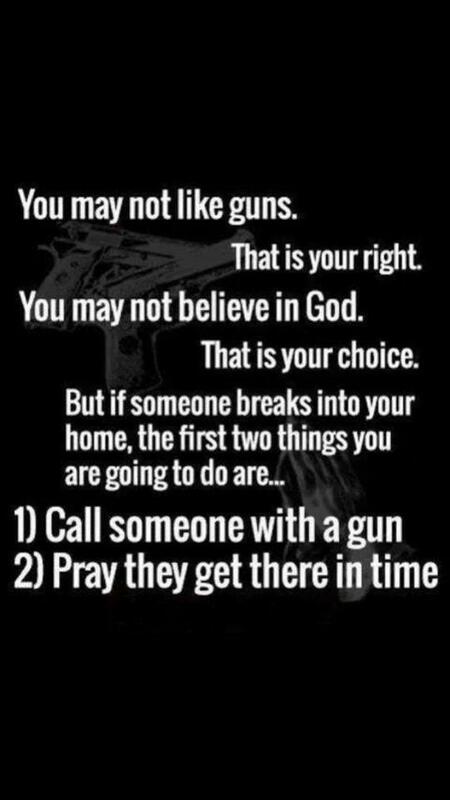 You can claim not to believe in the value of guns or God, it says, but in moments of trouble you’ll turn to both. Because godless liberals are all just raging, gutless hypocrites, doncha know? Well, speaking from personal experience as a cowardly heathen, I can say this is false. My apartment was robbed on New Years Eve. It sucked, and while the robber(s) didn’t take as much as they could have (thankfully they got scared off in the middle of unplugging my computer), it was still an infuriating and disheartening invasion of my and my roommate’s private space. Not so private, it seems. Yes, my roommate called the police, not to protect us but so we could file an official report with the infinitesimal hope of maybe recovering some of the lost items. I don’t claim to speak for my roommates. Maybe they’d like to have a gun in the house. It’s an option. I understand the desire for increased security, and I certainly don’t want us getting robbed a second time. Personally, though, I’d rather invest in better bars on the windows and a security system that can protect our place when we’re not here rather than a gun that a) would have been useless in this particular scenario (no one was home) and b) would pose a statistically greater risk to us than to any potential, future robbers. I’ve never taken any training in shooting a gun, and honestly, if I go my whole life without the skill that strikes me as a win. While I’m sure that makes me less of a man in the eyes of many people, I have a hard time understanding why living my life free of fear represents a shortcoming. We live in the least violent period in all of human history, I don’t have any delusions of being a vigilante. It’s possible that a crazed gunman could kill me at some point (and if so, shucks), but the odds of that happening are so infinitesimal that I might as well be watching out for falling anvils. So, I don’t believe in gods or guns. Why this offends the sensibilities of a large portion of America I’ll never understand. But, rest assured, in times of trouble, I don’t suddenly start praying for a .45. Now, let’s reverse the equation. To me, the most revealing aspect of that picture above is not what it says about atheists (nothing) or people who don’t like guns (again, nothing) or even what it says about what Christians/Gun Owners think about Atheists/Gun Non-Owners (nothing new). No, what it really reveals is the bizarre mindset of Christians who, despite professing belief in a loving, all-powerful, prayer-answering, omniscient God, still put their faith in a gun. A gun, which is a weapon for the purpose of killing (Exodus 20:13); a gun, which is used to protect your material possessions (Matthew 6:19-21); a gun, which is meant to keep someone else from taking from you and punish them if they do (Matthew 5:39-41); a gun, which is your protection against enemies (Psalm 20:6-8). A gun, which is about as appropriate in the hands of a Christian as a meat tenderizer is in the hands of a vegan. I believe this: A Christian who needs a gun is no Christian at all (I’m not referring to guns for the purpose of hunting, cos, whatever). I’ve said it before, and I’ll repeat it: There’s no such thing as an American Christian. It’s an oxymoron. 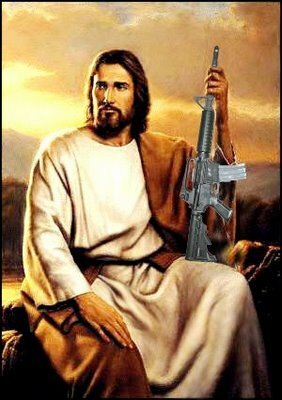 The gun ownership debate makes it pretty plain why: Whereas Jesus preached a message of peace, forgiveness, rejection of material possessions and a dedication to God that would require a person to abandon one’s family, the American life (the American Dream, in fact) is all about building up treasure on earth and guarding it like a rabid dog with special affection for vengeance and retribution. I see nothing inherently wrong with the American life, other than that it flies in the face of basically every single one of Jesus’ teachings. Reconciling the two diametrically opposed worldviews of American Capitalism and Biblical Christianity is a feat of such gymnastic contortion, even a yoga master would pull a muscle. If you want to own a gun, go for it. It actually is the rational choice for someone who has no belief in a higher power, and if I lived in a constant state of fear I might just be so inclined. However, a Christian who condescendingly suggests everybody needs a gun is admitting one of two things: Either their faith isn’t very strong, or their god isn’t. Thank you, Aaron. I hope so, too. But if not, we’ll deal with it. Having grown up in a Christian environment, it’s not hard for me to see the value in (some) of Jesus’ teachings. I just don’t think there needs to be a god for them to have worth. I think we agree on three issue. Americans are not really christians, atheism, and responsible gun ownership. You might find my proposal in that area interesting. As far as gun ownership, perhaps it too easy for unqualified people to own a firearm? After all, you have to have a license and proof of at least minimal competency to drive a car, fly a plane, and in some areas, operate a boat. Why shouldn’t you have to show that you understand the care and maintenance of firearms and safety issues involved and are able to take all the correct actions. This would include an understanding of self-defense ordinances in your area as well as any laws concerning when and where you may or may not be armed. When I (or anyone I know of) suggest gun control, this is what I mean. There always seems to be the assumption that any gun control will necessarily be “Draconian,” banishing all guns. There is a middle ground, which you’e described. Will gun control keep guns out of the hands of criminals? Probably not, though it might make it harder for people to become criminals. Also, it would help keep guns out of the hands of normal citizens who may one day cause someone else or themselves harm. The fact that gun owners get upset by the idea of a gun owner registry is hilarious to me. In every possible way, you are being tracked and recorded (and most of the time, because of social networking, you’re doing it to yourself). Having a registry of gun owners isn’t anymore invasive or pernicious than a registry of drivers. As you mention no gun laws will keep weapons from criminals. I now live in Brazil and gun ownership for private persons is very difficult. Yet, traficantes (drug dealers are often better armed than the police. When I mentioned “tracking” I just meant that that seems to be the fear that I hear from gun lovers so much. People think a gun registry would mean the government was tracking everyone who owned a gun, which besides being a meaningless fear (we’re all already being tracked by our phones), is completely beside the point. I wonder if they seriously believe they cannot be tracked now? Not everyone is tracked by our phones. Some of us don’t own a smartphone and some don’t have a cell phone at all. Not that any of that matters. Even here in Brazil, if the government decides you need watching, you are watched. End of story. When we’re dealing with the religious reich and rabid gun owners, (pretty much the same thing) we can’t expect rational thinking or any attention to facts, can we? I’m familiar with MMA, I wrote a few pieces for the site last year. I’m just bad about staying active in communities. Come on over, we’re still having fun. We get the occasional religious reich or Rethugnican stopping by to spout nonsense.